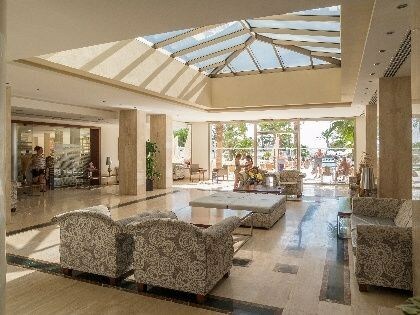 A nice promenade separates Aparthotel Playa Dorada from the Sa Coma long white beach situated only 50 metres away. Sa Coma is a modern resort with a lot of green zones, exceptionally sandy beach with the usual selection of water sport including windsurfing and pedalos to hire. Aparthotel Playa Dorada offers spacious apartments and comfortable studios placed in a 7-storey building. They are all equipped with a safety deposit box, heating, telephone with direct line, a complete bathroom (bathtub, bidet, WC), fully furnished kitchenette and a terrace. Apartments have combined living-bedroom, kitchenette and separate bedroom, in which four people could be comfortably accommodated. Studios have the same fittings as apartments except for a separate bedroom. The guests of all apartments will also have the opportunity to relax on their room’s terrace and enjoy the magnificent sea view. ALL INCLUSIVE Breakfast buffet from 07.30 till 10.30 Lunch buffet from 12.